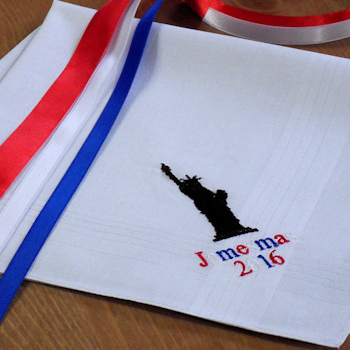 Unique and patriotic mens handkerchief gift featuring the statue of liberty emblem embroidered. Unique and patriotic mens handkerchief gift featuring the statue of liberty emblem embroidered. The handkerchief is personalised with a short name or initials. A stunning American theme handkerchief with Liberty motif embroidered onto a white cotton handkerchief. Choose a set of ladies size or mens size hanky. Select the font style and thread colour you want the name embroidered in. Select from a gift of one single hanky or a set of 3 handkerchiefs.